Nat and I relocated to Amsterdam for 6 months in 2017/2018. Within that time, we were lucky enough to explore and get to know this amazing city. 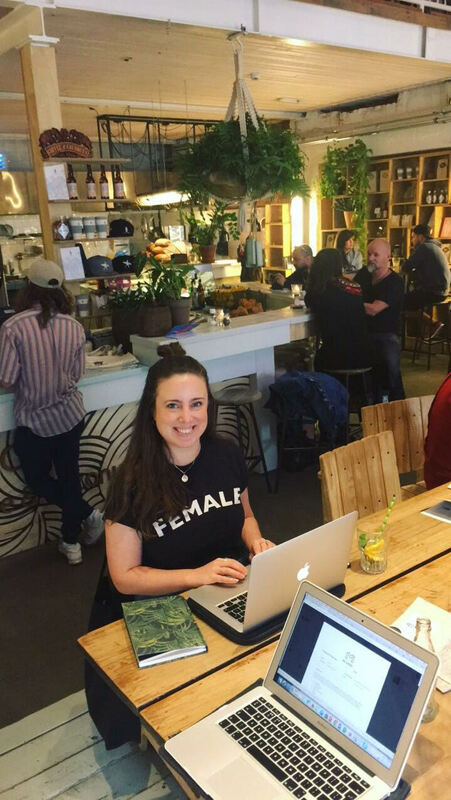 As freelancers working remotely it was important we found some great co-working spaces/coffee shops where we could continue our hustle and also get down to work. So we’ve collated our top 5 spots to hang out and “get s**t done” from while we were there. You're welcome. After being recommended by a fellow expat pal we set off for a lovely stroll across Amsterdam’s canals to the other side of the city from where we live. We’d been told that Zoku was one of the best places to co-work in Amsterdam whilst being able to look out at amazing rooftop views of the city. Welcome to Zoku Amsterdam. This place has it all. Views of the city, beautiful interiors and ping pong. The Pros: Amazing rooftop views and a beautiful working environment that is unrivalled by anywhere else in the city. Everyone LOOKS cool and the vibe is very chilled. A delicious lunch is provided if you purchase a day/month pass and you can have as many servings as you want (greedy, moi?). Also as the clientele are mostly international the co-working space is open 24/7 with fast and reliable Wi-Fi. The Cons: It’s expensive. It's 25 euros for a “day pass” which although included lunch (but no drinks other than tap water) & free access to the co-working facilities for the day felt a little steep. On top of that the staff weren’t very attentive. We ordered coffees and then had to ask three times over the next half an hour where they were. As we all know, a pre-10am caffeine fix is CRUCIAL to kick start your day off right. In the bustling and trendy Di Pijp (one of our favourite neighbourhoods and loved by the hip twenty somethings that flock here to party/live/eat bitterballen) is the epic Coffee & Coconuts. In the 1920's the building was a beautiful art deco cinema that has now been converted into a relaxed all-day cafe and restaurant for locals and tourists to enjoy. Pros: It's beautiful. I mean REALLY beautiful. The interior design is very contemporary and with a lot of thought and time put into how the space should look and feel for customers. The food menu is also great with a lot of different choices of food throughout the day and caters well for vegetarians and vegans too. Also a great place to meet fellow freelancers or clients for a coffee/chat. Cons: It's always VERY busy. So you'll be lucky if you can find a table - especially one for more than two people. Quite a few tables are "non-laptop/working" (for some unknown reason as that's what 98% of the 'day people' are there to do) so you have fewer opportunities to find one of those much needed spaces. Although there is table service (like a lot of Amsterdam) the service is very slow, so expect to wait up to half an hour for that chai latte. One of the first places I visited when I re-located to Amsterdam. This hotel is situated slightly outside of the centre of town. Although everything in Amsterdam is but a mere 15/20 minute cycle (even if it is in the rain). This place is also one of the coolest hotels in Amsterdam with one of the best rooftop bars with views of the city, outside hot tubs and "themed" hotel room suites that are both weird and wonderful. Very on brand for Mac&Moore then! Pros: Co-working is free as long as you stock up on coffees/drinks/food throughout the day. But let's face it - us freelancers need fuel to crack on with the work we need to get done so this isn't a problem. The atmosphere is really buzzy and there are always a lot of people about. There is also an awesome roof top bar/restaurant you can go grab a drink at if you've had a successful day (or if you just fancy a delicious beverage to congratulate yourself on a hard day's graft). Cons: As the co-working is situated within the foyer of a hotel it's often inundated with tourists checking-in and wandering about. This can be a bit distracting if you're trying to concentrate. It's also often very busy - so you need to get there early to make sure you get a good spot. The location isn't ideal and although the hotel offers a lot of amenities it's a bit out of the way - especially as we're based in Amsterdam West. A perfect hangout space Nat and I both love the FoodHallen, Amsterdam's answer to Brixton market or Shoreditch's Dinerama. Not only does it boast a mouth-watering selection of street food stalls but the building also is home to a beautiful cinema, shops, workspace and library. Being a 15 minute walk from both of our respective abodes means this is a great "meet up" joint for us to work out our next freelance hustle whilst also eating some of the tastiest foods in the dam. Oh and did we mention there's a fantastic Gin and Tonic bar in there also? The Foodhallen is home to some of the best street food Amsterdam has to offer plus an array of other facilities. One of our favourite hangouts. Pros: The location. It's so easy for us to get to and is also handy when we're thinking about treating ourselves to a delicious lunch (always)! The Wi-Fi is free and the staff are friendly. There is an upstairs section of the cafe that is a "quiet zone" if you need to get your head down and not be distracted. The downstairs offers a lovely relaxed environment and access to the library if you wanted a little browse for your next read or brush up on your Dutch. 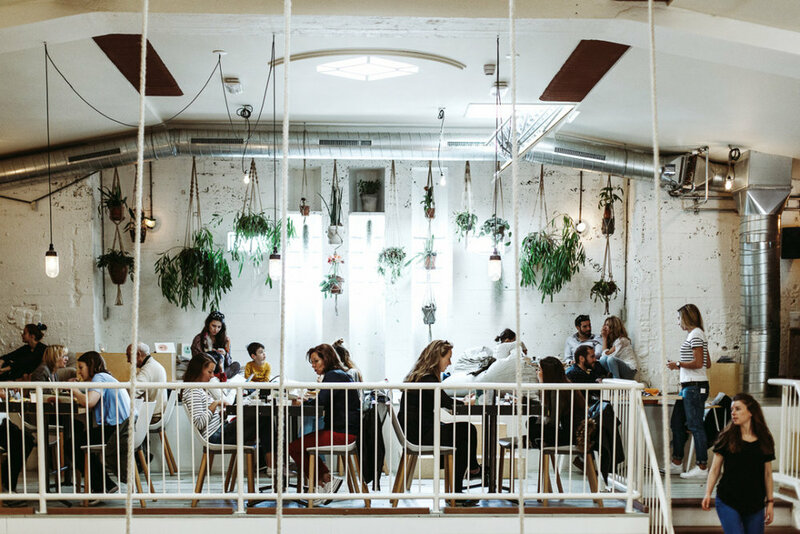 They also offer an array of "events" including live jazz on a Sunday and 'how to' DIY classes making this little place feel like you're part of a real community and for us expats that really counts. Cons: It definitely lacks the "cool" factor of the other spots mentioned in this blog and essentially is just a library cafe. It's pretty basic with it's food and drink offering and is definitely not somewhere fancy you'd be likely to take a client. I am lucky enough to live in the wonderful Amsterdam West. Full of amazing cafes, shops & never far from a lovely canal side walk. For the times I need to get my head down alone and not be far from home I’ve come to love this cozy little local café Friends by Foodism. 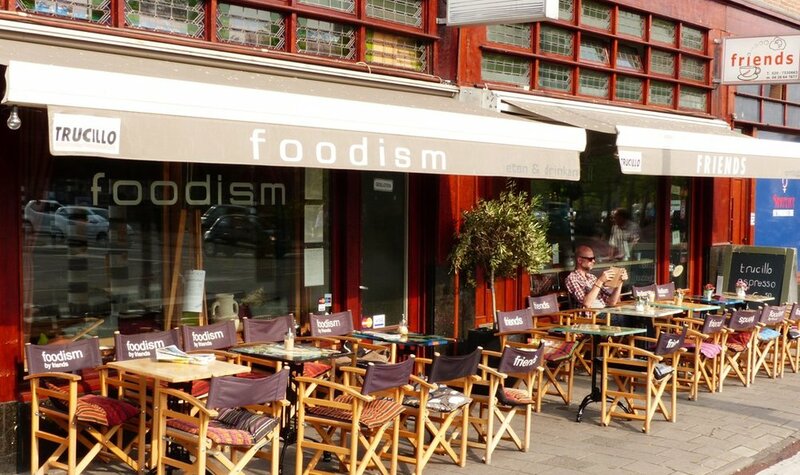 It’s fuss free and with the friendliest service I’ve encountered in Amsterdam (and trust me – that’s REALLY something!) The food is basic but very affordable and the atmosphere is very relaxed and worker friendly. This place goes to show you don’t need a “fancy & cool” coffee hangout to get creative and get your work done. Pros: It's cheap, it's local and the staff always remember you. It's always really quiet in the week days so it means I can be super efficient and get through a shed load of work with minimal distractions. Cons: Unless you're living in Amsterdam West I wouldn't say it was worth the visit. It's pretty basic with a limited food and drinks menu. Also I would definitely recommend ordering a milk-based coffee unless you like an Americano the consistency of tar and with the same industrial strength. So there you have it. Our run down of top freelance hangouts. From the local chilled cafes to the "go to" places in the trendy neighbourhoods there is something for everyone here in Amsterdam and something to cater for whatever nature of work you have to tackle that day. The Hoxton: A firm favourite of ours based in central Amsterdam where the people watching is as good as the freelancing. A great days work always ends up with a glass of very reasonably-priced wine here. Scandinavian Embassy: A really cute spot in Di Pijp with some of the best cinnamon buns i've tasted. Definitely worth a visit. I hope you've found this blog useful. And please leave in the comments any cool spots to #freelance here in Amsterdam. We're always on the look out for new places to try. And after writing this blog... I'm back to work. Over and out.